General Description: The Otter Creek type is a medium to large sized, thick, narrow to medium wide side-notched point with square tangs. The blade shape is ovoid to lanceolate, rarely trianguloid in outline with mostly excurvate blade edges. Blade edges can rarely be straight. About 20 percent of specimens will have a asymmetric blade outline which may extend to the basal and tang outline as well. The stem is side notched. The notching seems to have been the final knapping operation which resulted in square tangs. The base in usually concave and less frequently can be straight. The base and tang edges are usually ground smooth and this treatment is often extended to the notches. The Otter Creek is found across most of New England with the exception of Maine, especially west central Vermont near Lake Champlain and mid to southern New York, northern New Jersey and most of Pennsylvania. 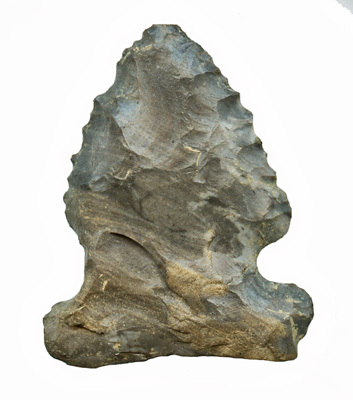 Otter Creek points were typically made from quartzite, slate, some flints or cherts and siltstone. The Otter Creek size can range from 52 mm to 104 mm in length with the majority being in the 70 mm to 89 mm range. 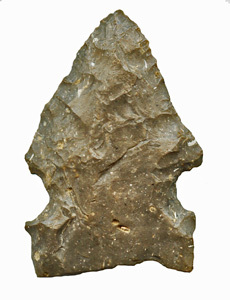 The point type was named by William A. Ritchie for points found by Thomas E. Daniels in the Otter Creek valley, near the hamlet of Orwell, Addison Co., Vermont.